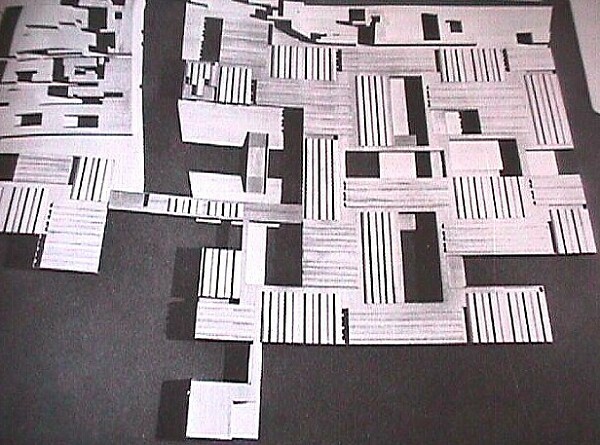 The new Hospital of Venice, 1965 in Le Corbusier 1957-1965, p. 141. I understand that you've described different stages/types of imaginations, a reference being here-o/0007. I was trying to delve into it and perhaps understand it for myself. I also find it interesting material to think about. 1- While understanding the above, would not the resultant outcomes of these imaginations not demonstrate the nature of the imagination construing them and really the premise behind this imagination (a chicken and egg kind of order; after all the imagination must be based upon some connection to a concurrent reality and vice versa) ? Furthermore, you speak of osmotic/assimilating/etc imaginations and, separately, osmotic/assimilating/etc architectures. Therefore, in a way of responding to my own question...having started reading Monoe's writing on Stirling in the Theoretical anxiety book, one could say that Moneo is describing what could amount to a prodigiously assimilative imagination that has produced different architectures, at different phases, many of which were not, in themselves as architecture, assimilative. Therefore, perhaps you end up with a theory of an imagination and another one altogether of the product of the imagination. 2- Seperately, since you propose an electromagnetic imagination as a forthcoming phase - en lieu of an around-the-corner finality- I was wondering whether an electro-magnetic imagination would be based on actuality of tending towards the electromagnetic - ie. our reality, technologies and so on- which implies -as an outcome- a virtual decorporalisation since the denominator here -even by figurative association- is the magnetic field generated, the charge of electrons and so on. Movement dictated by the nature of poles -not things- and relational pull on the basis of differential charge(Lit. )= Associations (Imagination) that transcend embodied presence to fluctuate, in a virtual air, between -perhaps- poles of previous imagination (Fig. ), operating within an archive of everything that has ever been, knowledge-wise, maybe? I can see how to approach osmotic, metabolic and assimilating; their modi operandi are somewhat eponymous, even if by way of figurative language. But electro-magenetic still puzzles me. 3- Also, I guess thirdly, another question: While I understand that you propose these as different types of imaginations that rein over different stages of human history (correct me if I'm wrong), is it not possible to use these as atemporal tools by which to cognize the different natures of past and present historical occurences and movements - in the vein of, for example, describing a baroque moment, be it in a pre- or post- baroque era? The Pyramids, Stonehenge, St. Peter's (Vatican), Bilbao(?) -- extreme, extreme architectures. The Pantheon, Hall of Mirrors, Versailles, entry sequence of Schinkel's Altes Museum, Kimball Art Gallery -- examples of the best osmotic architecture there is. Classical Greek and Roman Architecture -- pure architecture of fertility. The Hindu Temple -- the ultimate transcendence from an architeture of fertility to an architecture of pregnancy, whereas the Gothic Cathedral is an architecture of pregnancy, albeit virginal. To understand architecture of assimilation, look at the Renaissance, but also look to early 20th century Purism to understand assimilation in the extreme, ie, purge. Today's architectures are by and large assimilating and/or metabolic (contextual and/or 'deconstructivist'?). You're very lucky if you ever see pure examples of electromagnetic or frequency architectures today because they are almost entirely architectures of the far off future. There are many more examples to offer, but that's all for now. In general, I see all architectures as reenactionary (as opposed to reactionary). Architecture reenacts human imagination, and human imagination reenacts the way the human body is and operates. The human body and the design thereof is THE enactment. The human imagination then reenacts corporal morphology and physiology, and architecture then reenacts our reenacting imaginations. But interestingly, I again find this chasm between the description of an imagination and that of the architecture. Unless I have misunderstood. Do you mean that the design implication/intention/allusion of the Schinkel Altes Museum points to the osmotic (I could interpret that in conceiving of the façade as being rendered a permeable one, for instance) or that the imagination that bore it submitted itself to a process of osmosis from other sources? This comes back to item 1. The difference I'm imagining, would that be valid? On a personal level, I like that www.quondam.com is a museum of architecture that is not a building, and, moreover, a museum of architecture that goes all over our planet. Over a week or two ago I began planning a set of pages for Quondam that were to be entitled "the most incredible building of the 20th century." At the southern-most tip of the State of New Jersey, Cape May Point, there is a long abandoned World War II military bunker. When built, this bunker was 700 feet inland, but today "stands" about fifty feet out at sea. The coast there has shrunk, and the bunker is now very much an example of the Le Corbusian paradigm of a box elevated on pilotis. 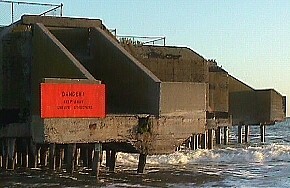 The bunker at Cape May Point is an enormous concrete hulk seemingly precariously poised on abundant tree-trunk pylons. 1. that it is literally a concrete manifestation of it's time, namely the middle of the 20th century during World War II. 2. that it is (or at least was) a prime example of modern 'fortress' architecture. 3. that it was once stealth, but over time has been explosed via the power of nature. 4. that it unwittingly now manifests exactly Le Corbusier's prime architectural theory for the 20th century, again the box raised on pilotis. 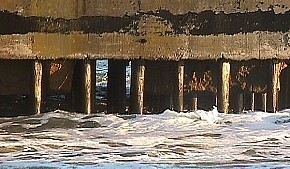 5. that it is now unsafe, inaccessible, and for all intents and purposes un-usable. Moreover, its future is uncertain, and may one day suddenly collapse. In light of the recent sad, sad fate of the World Trade Center Towers, I think the bunker at Cape May Point will have to take second place when it comes to "the most incredible building of the 20th century." Given that mat buildings have a strong precedent with Le Corbusier's design for a hospital of Venice, the notion of using similar mat buildings as part of the solution to New Orlean's architectural future isn't all that off the mark. The point of my [prior] post was to provide an alternative view to 'the end of history', one that sees the end (starting) over 4000 years from now. The metabolic duality tilts slightly toward the creative, as destructive metabolism--catabolism--harbors some constructive properties. Overall, I'm referring to stages of human imaginations and not some sort of stages of de-corporalisations. Coincidentally, I just finished dossier: metabolism metabolic (going back almost exactly 20 years)--4403. Some of it seems far-fetched, almost all of it is unpolished, and it's there now to see if an actual working thesis could come out of it. I honestly don't know if I can answer any of your questions adequately, so whatever I write here now is not to be taken as anything definitive. The notion of electro-magnetism and electro-magnetic imagination comes from the notion that the human heart operates as an electro-magnet, and what the heart pumps (blood) is what makes it pump. Is the heart then like a perpetual engine? Interesting, electro-magnetic radiation defines light. Is the electro-magnetic imagination a perpetual beat of light? Who knows? Since I feel as if my own imagination is slowly showing signs of ossification, meaning pliability has begun to harden, the implication of you're third question is perhaps the best all these notions may ever be useful for, if useful at all. But, then again, the answers really shouldn't come from me, but rather from how the body operates.